The wines of these establishments count every year to the absolute best of its kind and is almost unrivaled in the top - and that regardless of vintage variations. But the simpler plants are almost invariably excellent. Weaknesses, there are virtually no, and mediocre wines are as good as never before. Weingut Tement, Berghausen is a member of Wein‑Plus and thus supports this wine guide. Thank you! By creating Weingut Tement saved filter, you will see relevant matches on your home screen. The family winery is located on a small mountain plateau above the Riede Zieregg in the Austrian wine-growing region südsteiermark, From here, a panoramic view is possible, extending to the neighboring country Slovenia and the southern eastern Styria extends. Already at the age of 16, Manfred Tement took over the then only 2.5 hectare farm in 1976 and expanded it to its present size. In the year 2002 the wine cellar, completely redesigned after three years of construction, was opened above the Riede Zieregg. He was beaten into a former coral reef created 20 million years ago. The vineyards of the family business comprise about 80 hectares of vineyards in the locations Grassnitzberg, Hochkittenberg, Ottenberg, Sernauberg, Steinbach, Sulz, Wielitsch and Zieregg (in the picture). 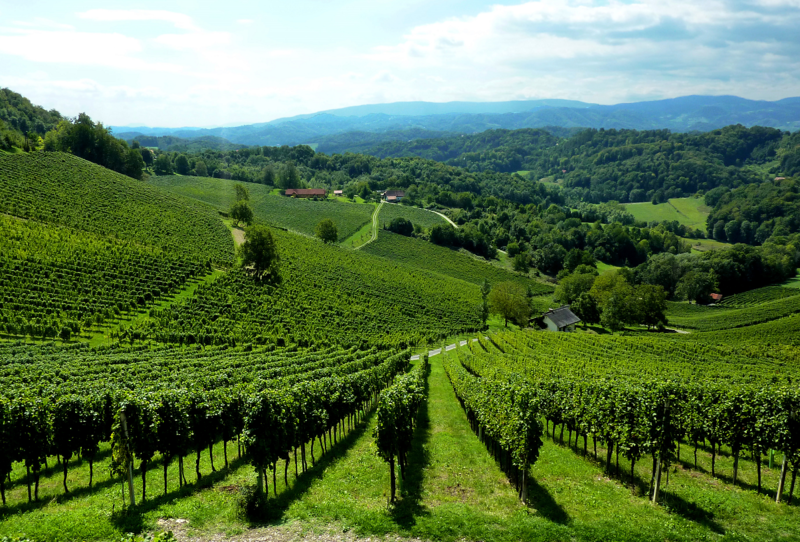 The latter reaches as far as the Slovenian territory, where land has also been cultivated for some years. 95% of these are white varieties Sauvignon Blanc (40% of total area), , Pinot Blanc ( Pinot Blanc ) Morillon (Chardonnay), yellow muscatel and Gewurztraminer, the little rest with the red wines Zweigelt and Cabernet Sauvignon cultured. Depending on the variety and location, there is a yield restriction of between 35 and 55 hectoliters per hectare. By selective grape harvesting in several harvesting stages, only healthy and fully ripe grapes will be processed. Depending on the type of wine, the wines are aged in steel tanks, in large neutral oak barrels or in used barriques. They are made according to the specifications of Styrian terroir & classic wineries in the stages "Steirische Klassik STK", "Erste STK Lage" and "Große STK Lage". Every year around 450,000 bottles of wine are produced. Since the year 2009, a Sauvignon Blanc under the name "Fosilni Breg" (German Fossil Mountain) has been produced from grapes of the Slovenian ornamental area according to Austrian quality criteria. The three winemakers Franz Xaver Pichler (Oberloiben), Illa Szemes (Pinkafeld) and Manfred Tement created the red wine brand together Arachon T.FX.T, which is produced in the municipality Horitschon (Mittelburgenland).